My Best Photos of Lake Tahoe, the "Best Lake in America"
I'm so not surprised, but Lake Tahoe won the title of "Best Lake in America" in a recent survey conducted by USA Today. The USA Today article with more info can be found HERE. I absolutely love photographing Lake Tahoe. It's incredible beauty is unmatched. In celebration of it's new title of "Best Lake in America", I thought I'd post a slideshow of 200 of my best Lake Tahoe photos. Click the full screen icon on the bottom right of the slideshow for the best view. Sit back, relax, and enjoy! The Lake Tahoe images above are available as large fine art prints, photo gift items, and to license, download, and use as stock photography. Click on an image for details. 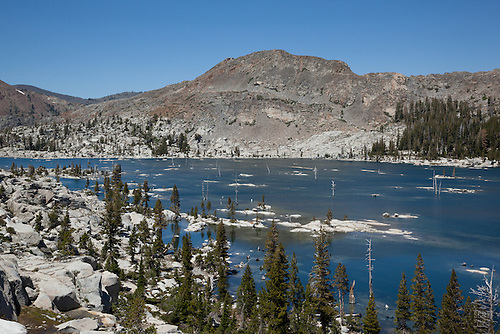 A Photography Adventure at Lake Aloha in Tahoe's Desolalation Wilderness. 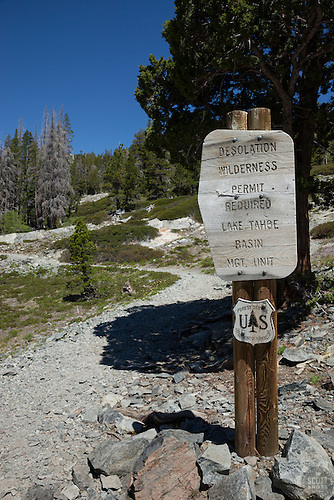 Last Friday, I headed out to Tahoe's Desolation Wilderness again. This time with Tony Spiker of SpikerPhotography.com, he and his wife also own the Vista Gallery in Tahoe Vista. Our destination was beautiful Lake Aloha. I had been there a couple weeks earlier on a big backpacking trip with my son and some friends (see previous blog post HERE). Although I got some great photos that trip, I wasn't 100% focused on photography like I planned on being during the Lake Aloha trip with Tony. We started backpacking from Echo Lakes fairly early in the day and after a nice healthy climb, we made it to Lake Aloha in great time. We had both decided to bring our tripods instead of tents so setting up camp wasn't much work at all. The food was hung in a nearby tree and the photo fun began. Lake Aloha is an incredibly photogenic lake. There are tons of dead trees, boulders, and small islands in the water. The shoreline has plenty of trails along it, there is also plenty of easy access to higher mountain peaks where you can get a great view of the lake from above. "Lake Aloha 4" - Photograph of Lake Aloha in the Tahoe Desolation Wilderness..
"Wildflowers at Lake Aloha 2" - These pink wildflowers were photographed at Lake Aloha in the Tahoe Desolation Wilderness. After getting some nice daytime photos, we took a break and Tony taught me how to fly fish. I'm a fishing fool but I had never fly fished before, and what a perfect setting to learn. Although we didn't catch any fish, I did catch this nice photo below. Thanks Tony for showing me how to cast, now, how am I going to convince my wife I need to spend the money on a new rod and reel??? 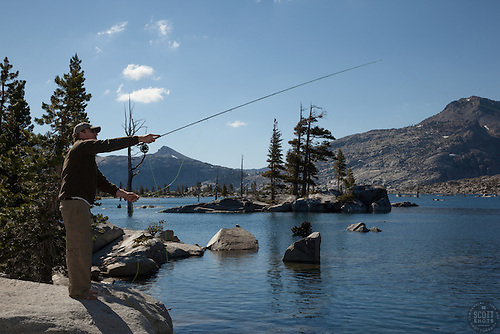 "Fly Fishing at Lake Aloha" - Photograph of Tony Spiker of www.SpikerPhotography.com fly fishing at Lake Aloha in the Tahoe Desolation Wilderness. 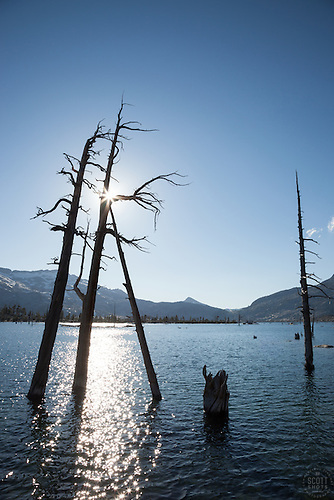 "Lake Aloha 12" - Photograph of dead trees at Lake Aloha in the Tahoe Desolation Wilderness. When it was time to shoot sunset, the few clouds that we did have had disappeared. But we still got lucky with a nice alpen glow that gave us purple and pink skies in one direction, and golden orange and blue skies in the other. Again, the dead trees in the middle of the water gave us very unique looking photo opportunities. 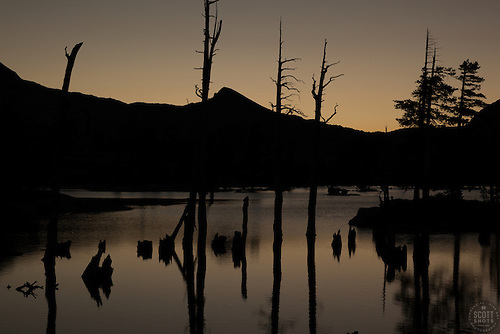 "Lake Aloha Sunset 6" - Photograph of Lake Aloha at sunset in the Tahoe Desolation Wilderness. As the sky started getting darker, we decided to do some light painting. Tony had brought his giant flashlight that works great for this kind of fun. During long exposures, he would shine the light on the dead stumps and trees to "paint" them with light. The flashlight puts off a much warmer color than a camera flash does and gives the image a great look. 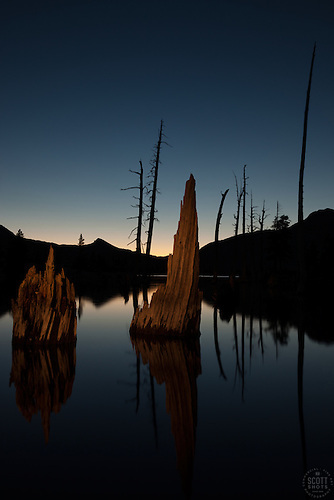 "Lake Aloha Sunset 8" - Photograph of dead trees and stumps in Lake Aloha at sunset in the Tahoe Desolation Wilderness. A flashlight was used to "light paint" the stumps during a long exposure. We kept on shooting long after sunset. The moon was fairly bright that night and lit up the landscape very nicely. I took quite a few 20+ minute photographs, getting a interestingly lit landscape with a bit of star trails in the sky. My last photo was just after 11 p.m., then I crawled into my sleeping bag exhausted but happy. 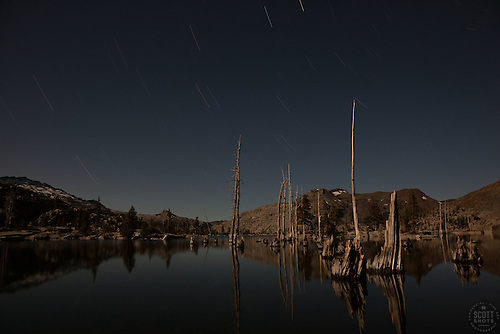 "Lake Aloha at Night" - A long exposure photograph lit by the moon of Lake Aloha in the Tahoe Desolation Wilderness.. I woke up at 4:45 a.m. to shoot the sunrise but unfortunately it wasn't very interesting at all so I crawled back into my sleeping back and got a couple more hours of sleep before heading back down the mountain. A quality big backpack. You'll need plenty of space for photo gear, camping gear, and food. One camera body. Skip the backup body or large battery grip. Lighter is better. A Tripod. I didn't bring one my first time to Lake Aloha and regretted it. It's more important than a tent in my opinion. A camera flash and possibly a big flashlight. Bug spray and sun block. There is no shortage of mosquitoes or sunshine at Lake Aloha. A food bag and a rope, or a bear proof food bin. The little ground critters are more of a problem than the bears in my opinion, they'll chew a hole through your backpack fast to get to the trail mix as I learned my first time out. Get your food hanging in a tree as soon as you arrive. A good water purifier. The climb to Lake Aloha takes a lot out of you. Clean natural springs can be found in the area at certain times of the year, but you should definitely have a filter pump, SteriPEN, or iodine tablets ready to go. 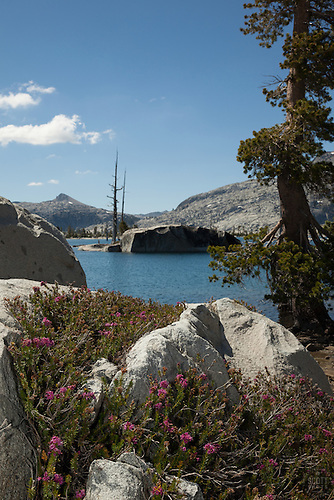 If you ever make it out to Lake Aloha or Desolation Wilderness, I'd love to see your photos. Please leave a link in my comments area. Here's a slide show of more photos I got on this recent trip. Enjoy! The images above are available as large and small fine art prints, gift items, and as stock photography. Click on an individual image for a larger view and purchasing information.